Following after the Wayzata Chamber of Commerce’s Appreciation Picnic, the Wayzata Fire and Police Departments hold their annual softball game known as the Old National Bank Cup. The skill level is quite diverse and the outcome provides bragging rights for the following 364 days. Thanks to our generous sponsor, Old National Bank donates $1000 to split between first and second place. The winning team of the Old National Bank Cup gets $501. Second place winner gets $499. 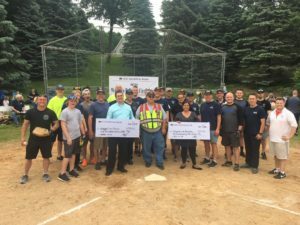 The Wayzata Fire Department plays for Second Call and Wayzata Police Department plays for the Wayzata Crime Prevention Coalition.